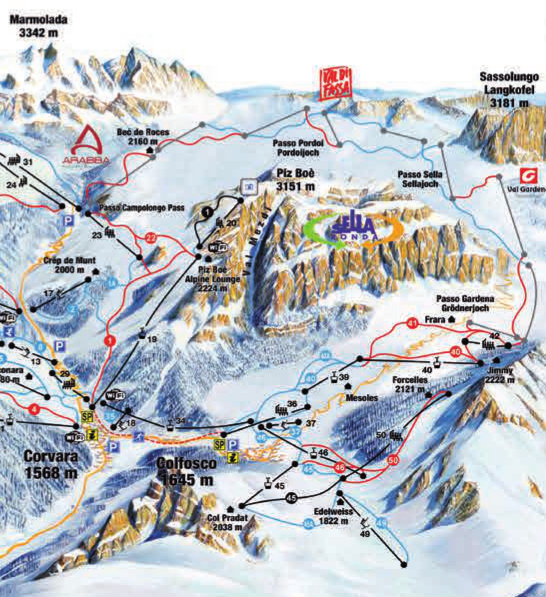 Val Badia – A beginners and intermediate skiers paradise! Leaving the Arabba range from Bec di Roces or driving directly to Passo Campolongo (35 mins by car/ 25km) opens a huge area of mixed terrain. It’s well linked and well served with restaurants and bars, offering something for everybody. Facing north towards Corvara, the runs to the left are steeper and more technical. whilst to the right there is a massive area of easy skiing. I’ll talk about this easy skiing first. It’s very easy to travel some real distance in this area. All the runs are wide and gentle, often through the trees. This makes it good for poor weather days as the contrast provided by the trees makes skiing far more enjoyable. The runs are also exceedingy well groomed which makes it fantastic for learners, young families and those who want a pleasant day cruising. Restaurant stops are frequent and serve excellent food . All the runs from Cherz are great – fast and fun. Descending to Pralongia gains access to the far side of the mountain and in one long run you can reach Armentarola and San Cassiano. From here either return towards Corvara, or you can take a bus or taxi to Passo Falzarego for a fantastic piste which runs down a hidden valley from the Lagazuoi – if you want a steady days tour on pistes this is it – wait for the sun and this run will not disappoint! Half way down there is a great hut to have lunch and soak up the sun in one of the most enchanting spots one could hope for beneath the huge rock walls of Conturines. A the bottom either schuss back to Armentarola, or jump on one of the horse drawn sledges for a small fee. Alternatively you can explore the heart of this area from Pralongia or San Cassiano – the runs are endless, blue after blue, red after red, never hard and always fun. It’s only when you find yourself near La Villa that they start to get harder again – the culmination of which is run number 5, from Piz la Villa, a famous black run whose bottom section is used as slalom course during the FIS racing season. Steep and unremitting, this run really is worthwhile if you’re looking for something a little more pokey. But generally the theme elsewhere is steady skiing and returning to Corvara is pretty easy, if a little confusing – leave plenty of time for “detours”. Leaving Passo Campolongo in the other direction the terrain is very different. Skiing at the foot of the Sella Range is steeper and more technical. Crep de Mont gives very quick access to Corvara, from where either you can reascend to the high Boe area with a black and red run in descent or you can take several lifts towards Colfusco and thence either up rightwards into a bowl beneath Ciampatch and Sasshonger or continue up to Passo Gardena. Skiing in the bowl above Colfosco is really nice, nearly always brightly sunlit with few trees gives a spacious set of runs. Going all the way to the top of Forcelles affords one spectacular views towards the Sella Massif, Val Mezdi and Sasshonger, the site of a famous Shane McConkey base jump. The runs from Passo Gardena are long and mostly fairly easy. Whilst graded red, they are mostly blue in difficulty with just a few harder sections. Again, the views afforded from the top are staggering and a stop at the hut just below the top lift is recommended- despite being rather busy and not cheap- it’s just an awesome setting for a quick refreshment. From here you can continue on the Sellarond down to Selva Gardena, or return on 8-9km of schussing runs past some spectacular ice falls – watch out for them from the chairlift and bubble cars on the way up! In all, Val Badia is great for the beginner and intermediate skier. You could ski here easily for a few days, hardly ever doing the same run, but we suspect you would find a few favourites and go back over and over!